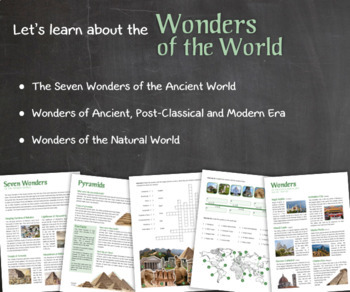 Let's learn about the Wonders of the World! 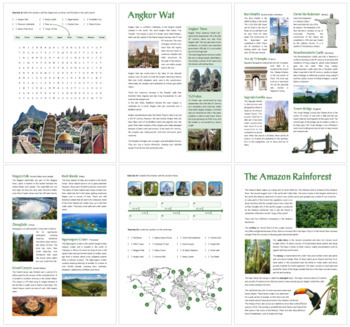 This worksheet includes 25 pages with a wide variety of activities and exercises about world wonders. 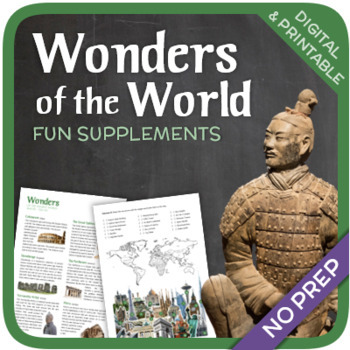 The materials have informative exercises about many different kinds of attractions such as the Pyramids, the Great Wall, the Coliseum, Stonehenge, the Eiffel Tower and many others! Crosswords, word searches, puzzles and other kinds of activities are included to make it a fun and interesting class. The answers and an answer sheet are included. You can save money by purchasing the Humanities Bundle! 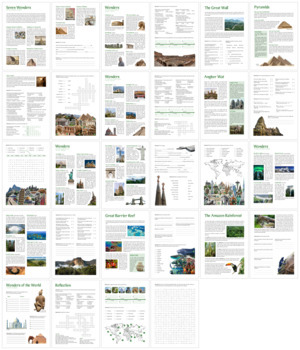 World wonder, attraction, Taj Mahal, Stonehenge, Pyramids, Coliseum, Angkor Wat, Chichen Itza, Parthenon, Sphinx, Terracotta Army, Great Wall, Petra, Machu Picchu, Tower of Pisa, Eiffel Tower, Statue of Liberty, Christ the Redeemer, Tower Bridge, Big Ben, Notre Dame, Osaka Castle, Forbidden City.